This is a bad news, good news story. Last year, I purchased the GPS Disciplined Oscillator (GPSDO) option for my Flex 6500 transceiver. This is meant to be a user-installable device that receives the GPS signal (1.2 - 1.5 GHz), derives very accurate time (UTC) and frequency (10 MHz) for use by the transceiver. And, of course, it reports your geographical position (latitude, longitude, and height above sea level) and speed. As you can see from the photo, the GPSDO appears to be based on custom version of a Jackson Labs GPSOCXO (Oven Stabilized Crystal Oscillator) module. 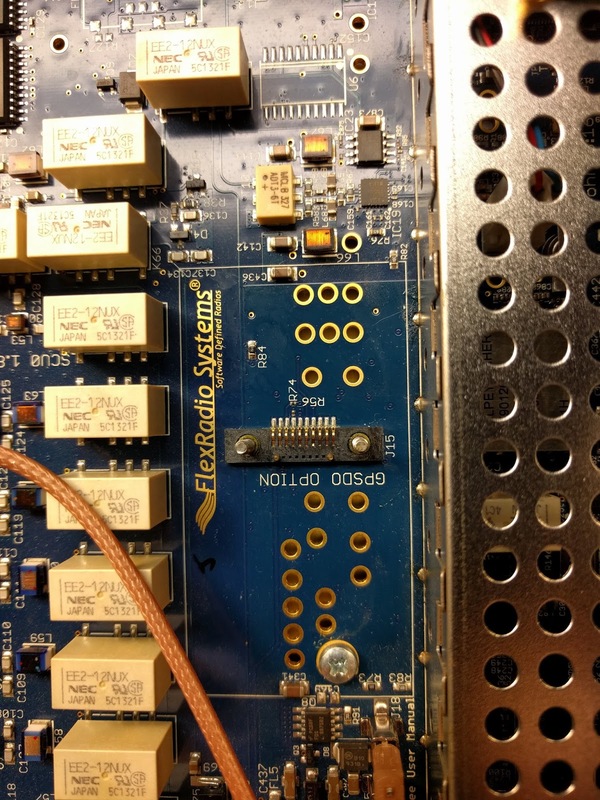 It's the green board that attaches to a blue Flex-produced interface board. The GPSOCXO specifications are available as a PDF, while general information is here. I am now on my third GPS unit. The first was a "reconditioned" unit, because new units were then in short supply. It never worked for me -- it would not detect satellites. Flex then supplied another unit, which worked well. It detected satellites, locked up, and appeared to deliver good frequency stability. But, over time, it grew hard of hearing. It dropped out of lock more and more and finally would not lock at all, though it continued to supply 10 MHz in "holdover" mode. Fortunately, my unit failed just before the warranty period expired, so I was able to get a replacement without (financial) trouble. Now my third (and hopefully last) unit is perking along. The good news! Currently, I use the Flex-supplied simple "patch" active antenna attached to a nearby west-facing window. Typically, I track 7-8 satellites out of 10-11 "visible". We might be able to squeeze out more performance by installing a larger outdoor antenna. 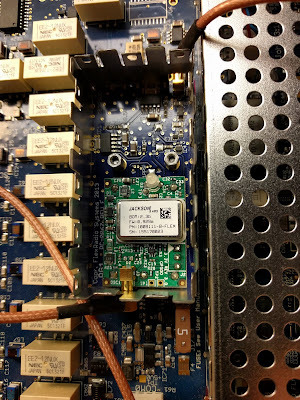 There's a good case to use GPS stabilization for VHF/UHF/microwave work, where oscillators are typically locked to a high harmonic of a 10 MHz standard. A portable GPS time standard is also useful for operating modes like JT65 or FT8 that require it. (Although, with care, WWV's HF time signals are also good enough.) Unfortunately, Flex does not yet offer time synchronization services for the radio shack. Maybe in the future. More: It's looking like this was a connector problem. (Electronics troubles often are.) If you look at the attachment area photo (here enlarged), you will notice the 10 golden spring terminals. 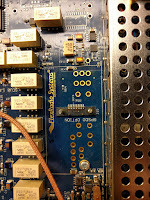 These touch gold-plated tabs on the GPSDO PC board. They provide all the power and computer signalling. It's not apparent in this photo, but if you look edge-on with a magnifier, you might notice that the tiny springs are not all in perfect alignment vertically. It seems that one or more of them were not making good contact. (The PC board screws down on the alignment posts, and the contact pressure has to be "sufficient" -- whatever that may be.) After a little fiddling with a tiny screwdriver, along with an alcohol cleaning, the GPSDO seems to be back in operation. For good measure, I also replaced the RF input cable. We will see if things are now stable. It has been OK for 12 hours! I have to say that the GPSDO-to-mainboard connection system is not the most robust. It looks like we had a marginally OK connection at first, which degraded after some temperature cycling or minor vibration. A traditional connector (with pins and sockets) would have been much more reliable, though a bit more expensive and less elegant. It's possible that all this last year's GPS travails came down to that connector, but I can't be sure. Yet more: After the connector fix, the GPSDO seems to be much healthier, but we were still experiencing occasional drop-outs (loss of sync). Moving the antenna outdoors seems to make a big improvement. The view is much less obstructed. I've made a stab at a weather-tight case for the little biscuit antenna using a large size prescription container and taped the whole thing to a nearby mast at about 5 ft elevation. We seem to be getting good sync about 10 minutes after a warm start, which is a lot better than before. 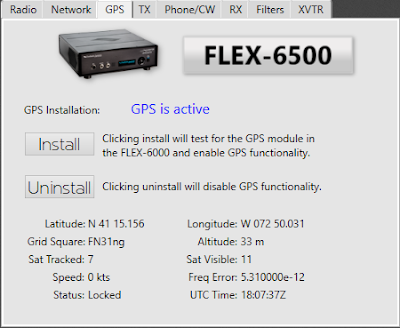 Sadly, the Flex module does not give any direct indication of GPS signal strength. There is also no way to log loss of sync events. Maybe this is a good time to start writing Python code to access GPS status from the radio via TCP/IP. I would like to log performance for a few days as a final system check.